We fabricate a seamless gutter on site to custom fit your home. The quality and performance of our seamless rain gutters are much greater then the sectional gutters found at a home improvement store. All seamless gutter systems are a 0.032" gauge continuous aluminum. We have installed gutters that measure over 100 feet without a single seam. Gutter systems that wrap around the house using an inside or outside corner are sealed with a high performance caulking. This self leveling caulking lays almost flat in the gutter allowing water to flow freely around corners. To keep the water flowing efficiently we install a larger sized downspout. This reduces the number of downspouts needed on your home and helps improve curb appeal. Having proper installation is the difference between a functional, protective system and one that will cause damage to your home. The most ignored item when installing gutters is the gutter apron. Why is this important? Gutter apron is the barrier that keeps water and ice from getting inside of your home. There is a gap between your roof deck and fascia board. Gutter apron covers this gap preventing water from entering your home. When snow and ice melt, the water can work its way into the gap and into your home. A clogged gutter will overflow and will also result in water intrusion. There are multiple options for directing water-flow away from the bottom of the downspout. Most commonly is a kick-out, which can be cut to any length. 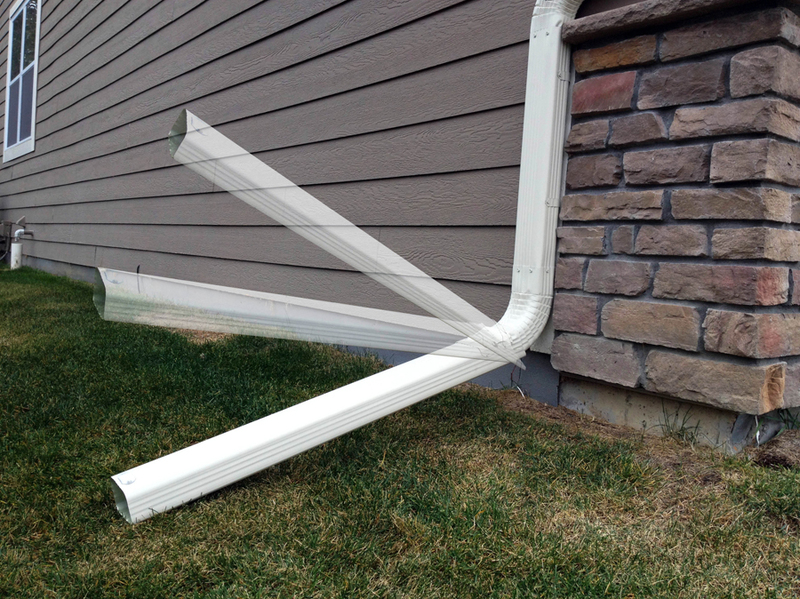 Downspout kick-outs cut at the edge of landscaping can be installed with a hinge tip-up allowing for easy mowing. Another option is an underground drainage system. The downspout directs the water into a drain pipe that will discharge at the end of the pipe. This is a great option where a kick-out obscures a walking path, patio or deck. Gutter and downspout comes factory painted with a two-phase baked-on coating. This means no rust and no paint chipping! Our large selection of colors allow the gutter system to match or accent your home, increasing curb appeal.